The Metropolitan Utilities District is the fifth largest public gas utility in the country providing clean, efficient natural gas to more than 229,365 gas customers. Natural gas is an economical, safe, colorless and odorless gas. For easy detection, we add a harmless chemical to give gas a distinctive odor. If you smell gas, leave the building or area, and then call our 24/7 emergency line at 402.554.7777 or 911. There's no charge for checking gas leaks. What is natural gas and its hazards? Natural gas is an economical, safe, colorless and odorless fuel. For easy detection, we add a harmless chemical to give gas a distinctive odor like skunk or rotten eggs. Natural gas is not poisonous, however it can displace oxygen in a room. Since it is lighter than air, natural gas dissipates quicker than propane or gasoline. While natural gas has a better safety record than any other major form of energy, its use requires caution. Potential hazards include fire, explosion or suffocation, however natural gas alone will not burn or explode. It needs the right amount of air and an ignition source. More than half of the reported natural gas accidents are caused by people digging before utility lines are marked. Call 811 two business days before digging. Today, everyone is trying to reduce their carbon footprint. One of the easiest ways is to choose natural gas for your energy needs. Natural gas is domestically abundant and environmentally friendly. More than 90 percent of the energy produced as natural gas is delivered directly to your home compared to just 27 percent for electric power. As a result, carbon dioxide (CO2) is greatly reduced; up to 75 percent decrease when using gas appliances. This quality is one reason why natural gas is the cleanest of all fossil fuels. 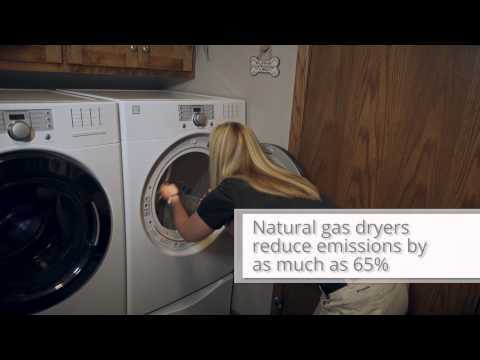 Choose natural gas when replacing old appliances or building a new home. You save money, and retain market value of your home. Your choice will help the environment and future generations. Natural gas supplies nearly one-fourth (22 percent) of all energy used in the U.S. In 2006, the U.S. consumed 20 trillion cubic feet (Tcf) of natural gas. Natural gas is clean, reliable and American, which makes it increasingly popular. Consumption of natural gas will increase 11 percent by 2020, according to the U.S. Department of Energy. Natural gas is a domestic energy source. In 2006, nearly all of the natural gas consumed in the U.S. (81 percent) was produced in the U.S. Most of the rest (16 percent) came from Canada with 3 percent imported as liquefied natural gas (LNG). According to the U.S. Energy Information Administration, with huge amounts of natural gas potentially available in shale formations, the U.S. could have enough to meet its current demand for more than 100 years. By one estimate, U.S. gas reserves now are equal in energy value to Saudi Arabia's oil reserves. The ample gas supplies also have pushed prices down. U.S. consumers pay half the going wholesale rate in many other developed countries. The natural gas supply picture changed with the potential of shale gas, which is being tapped with horizontal drilling methods and the improved use of water and chemicals to break up and recover gas in huge underground formations. Electric Power Generation --- More than half of the electricity generated in the U.S. is made from coal. Natural gas currently generates approximately 31 percent of total U.S. electricity. Natural gas is the dominant fuel of choice for new electric power generation plants because it is cleaner-burning. Also, natural gas combined-cycle plants can be built more quickly and less expensively than coal or nuclear facilities, which produces far more emissions than natural gas. So using natural gas to replace electricity in heating systems and appliances reduces our carbon footprint and is better for the environment. About 90 percent of the gas produced is delivered to the customer as usable energy. In contrast, only about 27 percent of the energy converted to electricity reaches the customer. On average, electricity costs four times more to use in your home than natural gas. More than 210 natural gas pipeline systems. 305,000 miles of interstate and intrastate transmission pipelines. More than 1,400 compressor stations that maintain pressure on the natural gas pipeline network and assure continuous forward movement of supplies. More than 11,000 delivery points, 5,000 receipt points, and 1,400 interconnection points that provide for the transfer of natural gas throughout the United States. 24 hubs or market centers that provide additional interconnections. 400 underground natural gas storage facilities. 49 locations where natural gas can be imported/exported via pipelines . 8 LNG (liquefied natural gas) import facilities and 100 LNG peaking facilities. Many gas companies purchase natural gas during the summer and store it underground, to help ensure that home-heating customers can be warm on even the coldest day. With natural gas, 90 percent of the total energy is delivered directly to you, unlike electricity where only 27 percent is delivered. We take natural gas safety very seriously. Experienced personnel routinely inspect and maintain natural gas mains, and crews are available to respond to emergencies 24 hours a day. Efforts like this pay off in making natural gas a fuel you can count on. We are proud that the natural gas industry has earned the best record for transporting energy safely and reliably. Licensed Heating and Cooling Contractors Assoc. Rules and Regulations covering the use of gas distributed by M.U.D. What has changed in CO detectors/alarms recently? What is the role of the U.S. Consumer Product Safety Commission (CPSC) in preventing carbon monoxide (CO)? What should you do to prevent carbon monoxide (CO)?